iPhone's calendar icon is changed automatically. So, you can know today's date by the icon at once. But, android calendar icon's date is 31th and remains static. Using tCalendar, you can confirm today's date easily on the home screen. 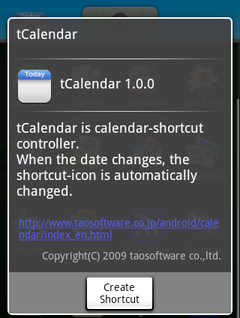 When you touch the icon, android's default calendar application is launched. So, you can use a calendar shortcut. Launch tCalendar and "Create Shortcut" button. A today's date calendar icon is created on the home screen. 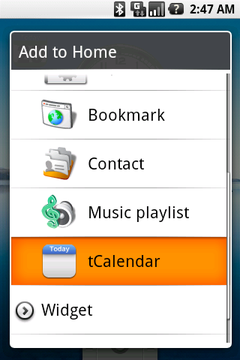 Also, touch & hold the home screen, select a tCalendar, and you can create a today's date calendar icon on the home screen. When the date is changed to next day, the icon's date is updated automatically. Above screenshot's date is "2009-02". 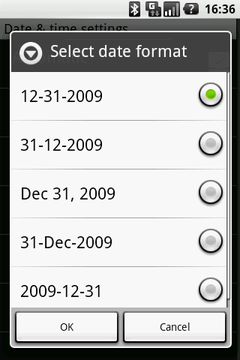 If you want to change to "02-2009", go to android's date format setting("Setting"->"Date & time setting"->"select date format") and select "12-31-2009". This format setting doesn't reflect the already created icon soon. The icon's date will be changed on the next day!!. When you use home application that creates a shortcut different way than android default home application, it is possible that tCalendar doesn't work. You can't find your using home application, please mail to us home application name and available tCalendar on it. We will check and update below list.